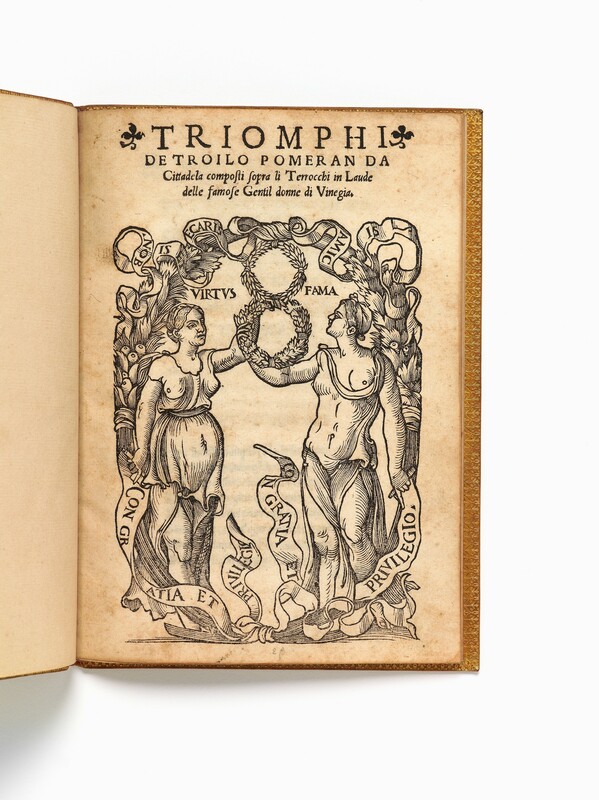 Triomphi de Troilo Pomeran da Cittadela composti sopra li Terrocchi in Laude delle famose Gentil donne di Vinegia. quarto (194 × 140 mm), (12) ff. signed A–C4, not foliated or paginated. 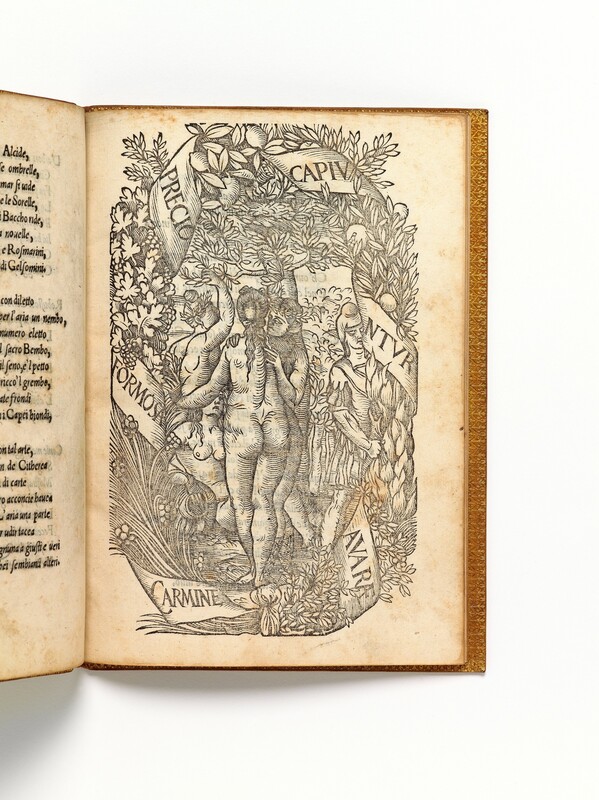 Large woodcut impresa (150 × 100 mm) on folio A1 recto (Virtus and Fama standing within a wreath, banderols at top and bottom lettered Nobis et ecaris [sic] amicis and Con gratia e privilegio; Fig. 1), another woodcut by the same hand (180 × 110 mm) on folio B1 recto (a group of five figures, lettered around Carmine formosa[e] precio capiuntur auarae; Fig. 2). Lightly washed; otherwise in fine state of preservation. binding nineteenth-century French citron morocco; covers decorated by a gilt centre-piece with red morocco inlay, back decorated in gilt and by red and blue lettering-pieces (in the style of Capé). Very rare volume of verse in praise of the noblewomen of Venice, loosely organised in four parts, commencing with thirteen stanzas of ottava rima (folios A2 recto–A4 verso) in praise of Venice and of Venetian women in general, whom the author imagines in a triumphal procession through an arbour, garlanded with flowers, their blond heads (capeibiondi) crowned with wreaths, each lady holding aloft a triumph card, as if it were a trophy. The second part has a pictorial sub-title and consists of twenty-two stanzas of ottava rima (folios B1 verso–C1 recto), with headings associ­ating specific women with the tarocchi trumps (Major Arcana). The third part comprises twenty-one stanzas of ottava rima (folios C1 recto–C4 verso) addressed to the author’s ‘Fenice’, in which her physical attributes are praised one-by-one; the fourth part consists of two quatrains and two stanzas of terza rima (folio C4 verso). No other publication of the author is known. The second part has attracted the attention of historians of trionphi or tarocchi card games, as an example of ‘tarocchi appropriati’ offering evidence of the sequence (i.e. relative values) of the trumps before the cards were numbered and trick-taking values codified. Pomeran starts with ‘The World’ and runs to ‘The Fool’, with variations to the usual order, and also unusual names: ‘Traditore’ (for The Hanged Man), ‘Tempo’ (for The Hermit), and ‘Foco’ (probably for The Tower).1 The cards were not given any divinatory meaning, but simply worked into the poem as a playful exercise of verbal agility, humour, and flattery. 1. Stuart R. Kaplan, The Encyclopedia of Tarot (New York 1986), ii, pp.185, 187; see also, Michael Dummet, Il Mondo e l’angelo. I tarocchi e la loro storia (Naples 1993), ‘Gruppo B’; and Lucia Nadin Bassani, Carte da gioco e letteratura tra quattrocento e ottocento (Lucca 1997), pp.88–90; Franco Pratesi, ‘Italian cards: New Discoveries, 7. Venetian tarot in the 16th century − evidence from specific literature’ in Journal of the Playing-Card Society 17 (no. 2, November 1988), pp.58–64 (link). 2. Five of Pomeran’s stanzas are translated into English by Kaplan, op. cit., ii, p.9: ‘Foco’, ‘Rota’, ‘Carro Triomphale’, ‘Temperanza’, and ‘Imperatore’. 3. 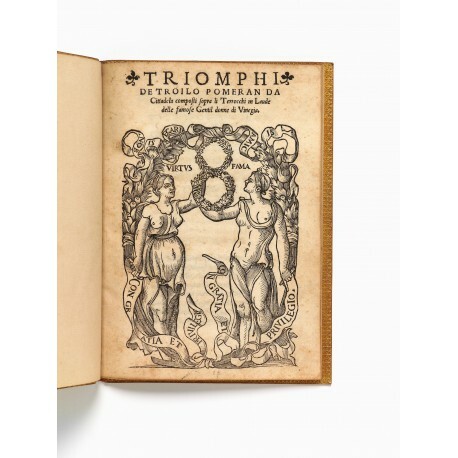 The only earlier publication cited by Kaplan is the Mantuan poet Teofilo Folengo’s Chaos del Tri per uno (Venice 1527), containing sonnets associating each of two men and two women – Giuberto, Focilla, Falcone, Mirtella – with five or six trionphi cards (Kaplan, op. cit., ii, pp.8–9). An unpublished ‘Pasquinate sopra il Conclave del 1521’ by Pietro Aretino and other manuscripts of uncertain dates are cited by Giordano Berti and Andrea Vitali, I Tarocchi: le carte di corte, gioco e magia alla corte degli Estensi, catalogue of an exhibition in the Castello Estense, Ferrara, September 1987–January 1988 (Bologna 1987), nos. 29, 32, 33, 35; see also Giordano Berti, Storia dei Tarocchi: verità e leggende sulle carte più misteriose del mondo (Milan 2007), pp.174–176. 4. Nadin Bassani, op. cit., pp.91–98. 5. S. Paterson, ‘Bibliotheca Croftsiana. A catalogue of the curious and distinguished library of the late Reverend…Thomas Crofts’, London, 7 April 1783 (and 43 days), lot 3758. 6. L. Potier, ‘Catalogue de livres rares et précieux, manuscrits et imprimés composant la bibliothèque de M. C[arlo] R[iva] de Milan, dont la vente aura lieu le jeudi 8 janvier 1857’, Paris, , lot 970. 7. 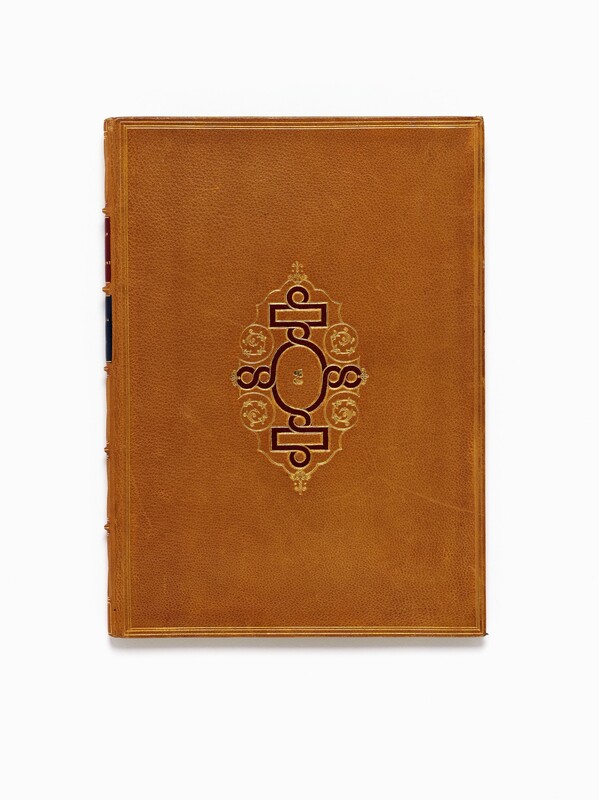 S. Leigh Sotheby and John Wilkinson, ‘Catalogue of the choicer portion of the magnificent library, formed by M. Guglielmo Libri’, London, 1 August 1859 (and 13 days), lot 2111. 8. [Fr. Roediger], Catalogue des livres manuscrits et imprimés composant la bibliothèque de M. Horace de Landau (Florence 1890), ii, p.386. Presumably the copy offered by the booksellers Frederick Startridge Ellis and David White (trading as Ellis & White), A Catalogue of Valuable Books Comprising Many Volumes of Great Rarity and Curiosity, London [c. 1883], p.78, item 532 (‘red morocco super extra, gilt edges', £6 6s), sold by Sotheby, Wilkinson & Hodge, Catalogue of the Very Choice Collection of Rare Books: Illuminated, and Other Manuscripts Books of Prints, and Some Autograph Letters, Formed by Mr. Ellis, London, 16 November 1885, p.306 lot 2409 (‘red morocco, gilt edges’, £2 2s; link), and now in Biblioteca nazion­ale centrale, Florence. Pratesi, op. cit., p.58, writes: ‘The copy now preserved in Florence National Library, coming from the Landau Finaly collection, is singly bound in red morocco super extra, with a gold garland printed on the plates [i.e. covers], decorated flyleaves, gilt edges’. 9. Harvard College Library Department of Printing and Graphic Arts; Catalogue of Books and Manu­scripts, Pt. 2. Italian 16th century books, compiled by Ruth Mortimer (Cambridge, ma 1974), no. 393. 10. Local opac reports ‘Esemplare mutilo del fasc. A4’. 11. Tammaro De Marinis, Il castello di Monselice; raccolta degli antichi libri veneziani figurati (Verona ), p.96; Dennis E. Rhodes, Catalogo del fondo librario antico della Fondazione Giorgio Cini (Florence 2011), p.213 no. P105. 12. Exhibited by Berti and Vitali, op. cit., pp.106–107, no. 30. 13. No copy is known to the editors of Edit 16/Censimento nazionale delle edizioni italiane del XVI secolo (link); the only one traced by the writer is ● Vienna, Österreichische Nationalbibliothek, 56.K.44. (3. ), digitised (link). A copy was once in the library of Jean-Baptiste-Pierre Jullien de Courcelles (1759-1834): Leblanc, Catalogue des livres et documens historiques, manuscrits et imprimés, autographes, etc. composant la bibliothèque de feu M. de Courcelles, Paris, 25 June 1835, pp.79–80 no. 752 (link). The same or another copy passed through the collections of Gustave Parthey — Charles Fairfax Murray (Catalogo dei libri posseduti da Charles Fairfax Murray, London [i.e. Florence] 1899–1902, p.276, no. 1577) — Giuseppe Martini (sold by Libreria antiquaria Hoepli, ‘Bibliothèque Joseph Martini, deuxième partie’, Zürich, 21–23 May 1935, lot 167), since when it is unlocated. See Sander, op. cit., no. 5833; Biblia, op. cit., no. 3790; Carpané, op. cit., p.206 no. *11.